This Page old, dont use SVN anymore! Before we can start, we need to set up a compiler toolchain targetting TomTom devices. TomTom provides a a pre-compiled compiler toolchain for Linux and Windows (CygWin). It can be downloaded from TomTom's website: http://www.tomtom.com/page.php?Page=gpl. This file needs to be unpacked into /usr/local/cross. Finally, some standard build tools are necessary for building some of the libraries and the Navit binaries. The most important one is the autotools suite, including autoconf, automake, autoheader and aclocal. Install these if you don't already have them. The toolchain is now ready for use. Several libraries need are needed by Navit and must be ported as well. This has been tested with zlib 1.2.5. Older versions require AR to bet set to "arm-linux-ar -r" instead. Before proceeding, make sure to reset it to arm-linux-ar because the "-r" switch is needed only by these old zlib versions and will cause conflicts compiling the other libraries. Make this file read-only to keep configure from overwriting it, configure, make and install. The new TomTom versions (ONE, XL) require a different driver. For these devices, uncomment "module_raw input" instead. Finally, use autogen.sh to create a configure script, configure, make and install. Since we have not ported gtk, as we will use libSDL and the internal GUI only, we have to disable the gtk drivers in the configure command. Within the navit directory, create the following directories: bin, lib, share, sdl and ts. Now these directories have to be filled with content. This will create an entry named "Touchscreen" in TomTom's main menu. Replace "sdl-wrapper" with the name of your wrapper script, if necessary. </source> The following lines tell libSDL to use the touchscreen as mouse input, to hide the mouse pointer and to use the framebuffer. The last lines set Navit's language and run the Navit executable. stderr is redirected into a log file, since there is usually no console available to view debugger output. 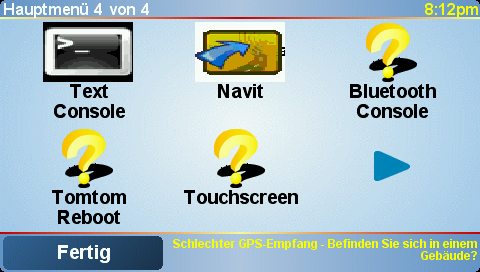 TomTom menu with Navit icon. Any navigation software would be useless without maps. See the Maps section for maps you can use with Navit. Put them into the directory /media/TOMTOM/navit/share/maps which you have just created. As long as you don't have gdb on your TomTom, set the segfault debugging level to 0, i.e. let Navit crash without printing a stack trace via gdb. Otherwise Navit will complain that gdb can't be found. Use libSDL for graphics output. Set the screen witdh and height as well as the bits per pixel fitting to your TomTom device. (Have a look at http://www.opentom.org/Hardware_TFT_LCD for a list of screen sizes.) Disable the window frame and set SDL flags such that "software surfaces" are enabled. Use the internal GUI. This is most suitable for touchscreen devices. GPS data can be fetched from a file named /var/run/gpsfeed. If you have gpsd running on your TomTom device, you can simply use gpsd instead. Finally, enable the mapsets you wish to use. Remember that TomTom's disk will be mounted at /mnt/sdcard at runtime, so any maps you place in the navit/share/maps folder will appear in /mnt/sdcard/navit/share/maps (which is the same as $NAVIT_SHAREDIR/maps, if you have set $NAVIT_SHAREDIR as shown above). Running Navit is as simple as a touch of a button. Disconnect your device properly from the computer and let it reboot. Touch the screen to enter the main manu. On the last page of the main menu, a new menu entry named "Navit" should be visible. Simply press the Navit button and wait for the Navit screen to appear. Have fun! You can now switch on debugging output for different parts of Navit by increasing the corresponding debug level. For example, to obtain standard debug messages from the Navit core application, increase the debug level in the "navit" entry to 1. For more debug output, you can use higher numbers, i.e. setting the debug level in the "osd_core" entry to 5 will give you plenty of debug output from the on screen display plugin. The debugger output will then be placed in a file named "navit.log" in the navit folder on your TomTom. It is often useful to run programs from a console. For a simple console running on TomTom devices, have a look at TomTom Console. It seems not to run an all TomTom devices and software versions, so you may try using Btconsole instead, which allows you to login to your TomTom device via bluetooth.